How many of you have used aromatherapy? I recently had the opportunity to experience the SpaRoom AromaMist ($60 on the website). I really like this. Not only does the AromaMist allow you to experience aromatherapy, but it also has a subdued LED light. This is so easy to use. After you plug in your AromaMist simply lift the lid off and add 1/2 cup of water to the fill line. Then choose the essential oil you want to add. You can adjust how many drops you place to get the amount of fragrance you desire. The first time I used the peppermint I put in five drops. For bedtime it was a little too much. The next evening I only added three and it was perfect. I have also tried lavender, lemon and rose. Lavender and rose are my night time favorites. The ultrasonic mister will run for three hours. You can also run the AromaMist without oil or scent, but adding the oil is what I enjoy most. There are two buttons on the front of the AromaMist that control everything. The first button controls the LED light. The light slowly cycles through several colors. You can also choose to have a steady blue or red. I prefer the blue as the changing colors kept me awake. The blue is pale and gives off just enough light to be soothing. I like to have just a little light at night and this light does not bother my husband. The second button turns on the AromaMist. As soon as you press the button a scented mist slowly starts rising from the top of the product. I placed mine on my side of the bed and within seconds I can smell the fragrance. Very relaxing! It shuts of when it runs out of water. I also received the SpaRoom new AromaPen. This is so nice! 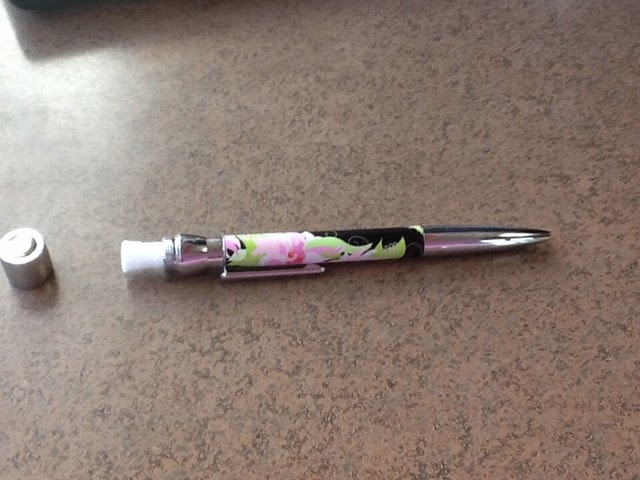 It comes with rods that you add essential oil to and then place it in the top of the pen and screw the cap on. The cap has tiny holes to release the scent. I have been using my peppermint essential oil with the AromaPen. My children laugh because they often catch me sitting in front of my computer with the AromaPen in my hands inhaling. It is very soothing. 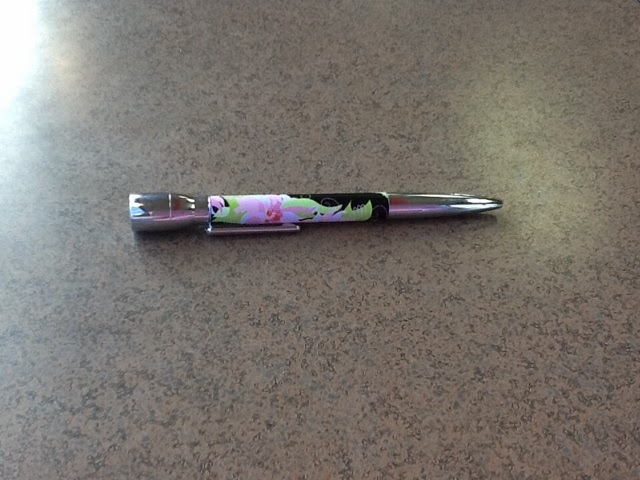 You can purchase the pen on their website for $30 plus shipping. It comes in two colors, lavender or botanical. If you do not have essential oils you can place a few drops of your favorite perfume on the rods. We have recently started using more essential oils around the home, and the SpaRoom Aroma Mist and AromaPen are fitting right in. If you are looking for a good diffuser consider the AromaMist. The AromaPen is just right to stick in your purse and use throughout the day. Be sure to follow them on their social media pages. You will find them on Twitter - HERE and on Facebook - HERE. SpaRoom Essentials offers the perfect combination of aromatherapy, healthy humidification and essential oil line of products. SpaRoom Essentials products are designed to provide the health and wellness spa markets with a better sensory experience–anytime, anywhere. From healthy humidification and soothing aromatherapy to the perfect slipper, anyone can create a spa-like feeling that will enhance their environment wherever they go. Many of SpaRoom’s products have already gained acceptance by leading salons, spas and specialty retailers throughout the U.S., and also in Europe. I would like to get two more of these, so I can put one in the main gathering room and one in my daughter's bedroom. Thanks for stopping in. See you soon. This looks like a very good defuser. The quality seems pretty good and the design is very attractive. Add a touch of Ceylon Cinnamon Bark Oil which research shows improves your mood and we have a winner. Stella and Dot Summer Sale! Reebok Memorial Day Weekend Sale! Build Your Bundle Homeschool Opportunity! National Chocolate Chip Cookie Day! Pair Tree Products Review and Giveaway!